This post reflects events that occurred in September 2007. We met my sister and her husband, Carol and Lloyd Jackson at the Timber Valley RV Park in Sutherlin, OR. We try and meet up when we are close. Our travel routes are usually different, but some of our destinations are the same. Carol and Kathi took a walk on Sunday morning September 2nd. Carol walks every day and none of us can keep up with her. She stays about the same weight she was in high school. After their walk, Carol and Lloyd had some things to do around their RV, so Kathi and I drove about 40 miles south on I-5 to Canyonville and the Seven Feathers Casino. 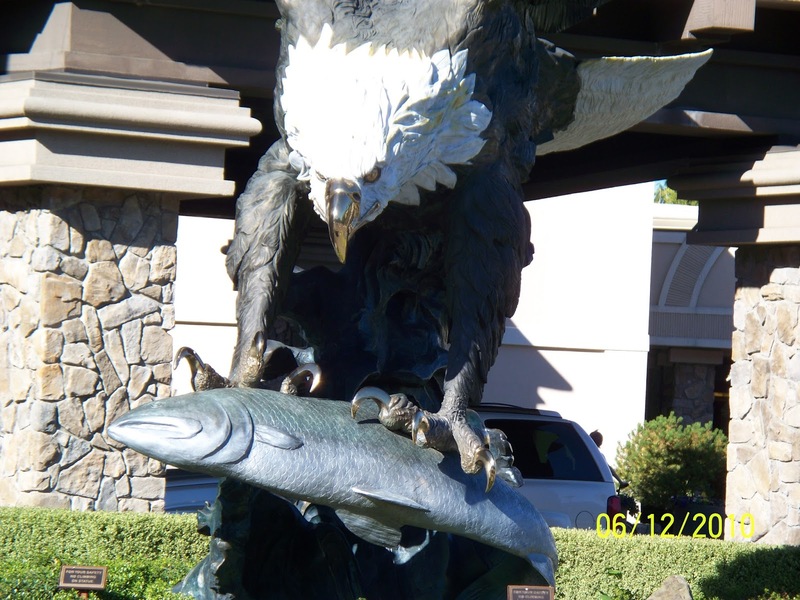 Seven Feathers is run by the Umpqua Tribe. Across I-5 from the casino they also have the Seven Feathers RV Resort. The RV park is paved and unlike many parks we have seen, this one looks like a resort. We thought the rates were a little high for us, but it would not be bad for staying one night for casino play. 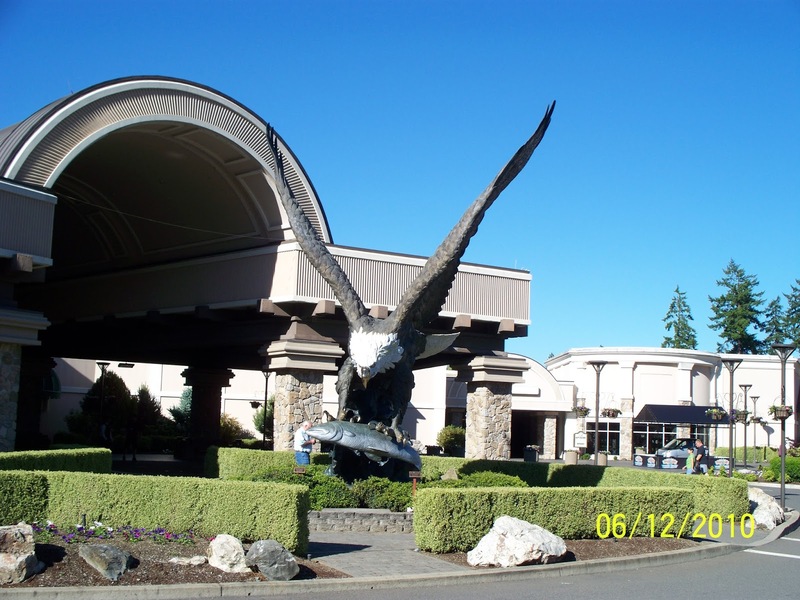 The RV park and the casino were nestled in a hilly area of I-5 and both were surrounded by evergreen trees. Driving on the canyon roads was a real thrill, up and down the hills and winding roads around the mountains. That Sunday we spent about four hours in the casino. We started with a great meal at their lunch buffet and spent the rest of the time playing their slot machines. We enjoy the penny machines most, but you actually do not spend pennies. Most of the machines will allow you to play up to two dollars for each play and a few go as high as five dollars. We vary the amount we wager, depending on how much fun the machines are, how much we have to lose and how long we plan to stay. This day we were playing seventy-five pennies or one hundred pennies. After four hours we were about even, so we took that as a nice time to go home. We spent a couple of hours in the evening visiting with Carol and Lloyd discussing travel adventures. We took Carol and Lloyd to the Apple Peddler restaurant in Sutherlin for lunch on Monday. The food was just okay, but the conversations were great. Lloyd had been doing most of the driving while we were touring Sutherlin and Roseburg, so Kathi paid for our lunch. We took a time out for an after lunch nap and met at our RV in the evening to continue visiting and holding travel conversations. Our plan was to leave on Thursday and move into California. We planned to be around San Francisco to see our oldest son, AJ in about a week. Thanks for reading my blog. I liked this post myself. Oh, well. I guess I like writing all of them. There are so many memories that do not stay fresh in my mind.